Near perfection was beaten by someone coming even closer to perfection. The final pairing of Phil Mickelson and Henrik Stenson produced 14 birdies and one eagle! Brilliant shot was matched by brilliant shot. Great putt was topped by great putt. This is links golf where imperfect results can result from near perfect shots. Each player hit drives, irons, and putts to exacting locations that no one in the field showed they were capable of doing. Except for two three putts from Henrik Stenson, it could be argued that these two rounds were the greatest display of shotmaking and scoring in a major championship ever! The 1977 Open Championship at Turnberry has generally been regarded as the best head to head competition between two great players in the modern era. Tom Watson bested Jack Nicklaus on the final day shooting 65 to Jack's 66. Tom's winning total beat the third place finisher by 11 shots. Henrik's score tied the all-time lowest under-par 72 hole total, tied the lowest final round score, and beat the third place finisher by fourteen shots! Jack Nicklaus has posted a congratulatory note to Henrik and Phil on Facebook and stated that Phil's round was one of the greatest he had ever witnessed, but that Henrik just played better. He also mentioned his epic battle, call the "Duel in the Sun" with Tom Watson and how they both played great and had a wonderful match, but then stated that their rounds today where even better! Nothing should take away the accomplishments of Stenson and Mickelson and there record breaking achievements. Scores could have been different if the course had not been softened by rain and the greens allowed to putt at a relatively slow 9 ½ Stimp reading. This allowed the players to be more aggressive with their putting approach. That said, no one even came close to playing like they did. 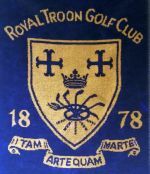 The Royal Troon Golf Club motto is "Tam arte quam marte", which translates to "both skill and initiative". The Royal Troon secretary told me many years ago that their membership interprets their motto as "As much by skill as by strength". Henrik Stenson won an epic victory that will be replayed and relived for many a year as one of the greatest. He truly adhered to the Royal Troon motto of having the strength but conquered by great skill!